All of our services at Lake Norman Dent Repair are performed by trained technicians with years of experience. It is our goal to provide the best mobile dent repair and minor body repair services Mooresville, NC has to offer. That is done with a professional and courteous approach. Our service goes beyond the actual repair process as our customers have come to count on our integrity. Lake Norman Dent Repair is proud to provide our services to a community we are proud to call our own. This service is at the core of what we do at Lake Norman Dent Repair. It involves removing dents by shifting and shaping the metal back into place. Our service does not require any painting as our expert technicians are able to mold minor body damage back into its original form. This can be done while customers wait as our technicians can complete this process in less than an hour. Damage must first be assessed in order to qualify for our paintless dent repair service. Hail can do just enough damage to cars to make some unsightly blemishes on your vehicle. That damage is no problem for the technicians at Lake Norman Dent Repair. Our hail damage repair service can get rid of that damage without having to do any major body work. Using state-of-the-art tools, we can make your vehicle look as though it never experienced a hail storm. Door dings happen to everyone at one time or another, but that does not mean you have to live with that damage. As long as those dings are less than an inch in diameter, they can be removed with our non-invasive process. If you have a door ding or multiple dings and want them gone, our removal service is the answer. The service is available on all types of vehicles and our technicians are fully-insured to give clients an extra peace of mind. Our minor body repair service is intended to remove all the little dents and dings to your vehicle. This service is described as minor because it does not require any major overhauls that might change the structural integrity of your vehicle. 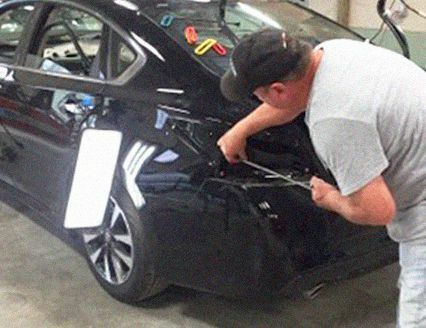 This kind of body repair is done without having to remove any parts and replacing them with new ones. The end result is a fast and convenient service with very affordable rates that can even be covered by your insurance. Proudly serving the greater Lake Norman counties: Iredell, Mecklenburg, Cabarrus, Rowan, Catawba, and Lincoln, including but not limited to the cities of Mooresville, Davidson, Cornelius, Huntersville, Charlotte, Troutman, Statesville, Hickory, Sherrills Ford, and China Grove. Do we serve in your area? Just give us a call at (704) 445-5226 to find out!